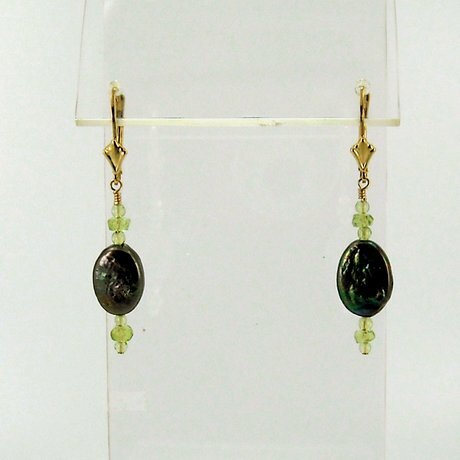 Home :: Earrings :: E0504 - Forest Mirror 1.5"
E0504 - Forest Mirror 1.5"
These lovely green oval freshwater pearls seem to reflect the deep green of an Evergreen forest. The Peridot rounds and faceted roundels compliment them wonderfully. Earrings made from 10 x 15 mm green oval freshwater coin pearls, 2 mm Peridot rounds and 2 x 3 mm faceted Peridot roundels. Hung from 14 kt gold filled lever back ear wires with a Fleur de Lis design.